12 | May | 2013 | Plan. Shop. Eat. Live. Tonight’s dinner is going to be Mexican-inspired. I am creating a Texmati White Rice with Cilantro and Lime. The rice and cilantro are organically grown. The lime is conventional. I haven’t been able to find organic fresh limes – just lime juice. This is a really easy recipe. Just boil a quarter cup of rice (per serving), chop cilantro as finely as possible, and take a quarter lime, squeeze the juice and then finely chop the pulp. Add the cilantro and lime to the rice. Be sure to let it sit for about ten – fifteen minutes to let the flavor completely cover the rice. 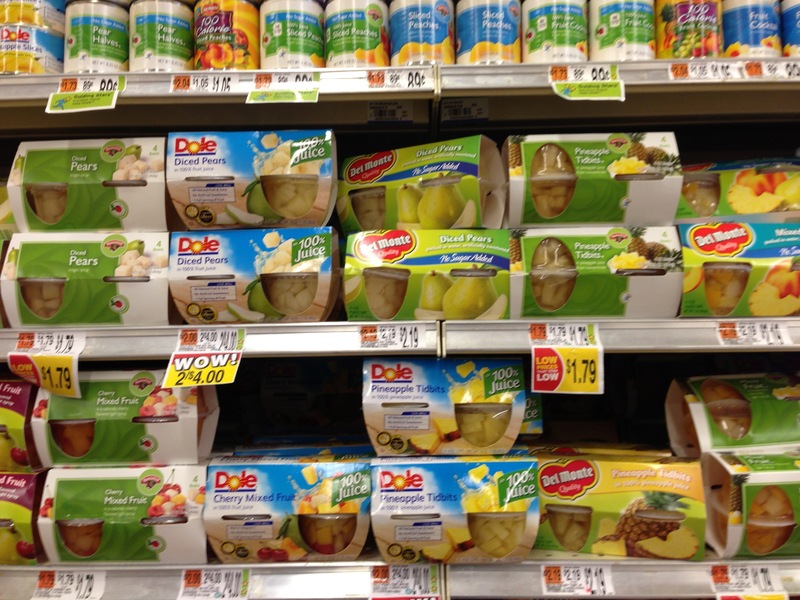 These “fruit” cups pack about 18 grams of sugar per serving. Even the sugary kids cereals have less sugar per serving.